To be held at the Injune Administration Centre on 23 November 2011. The purpose of this report is to provide and understanding of the current issues and opportunities for Council to intervene and improve housing opportunities in the region. The Surat Basin Corporation seeks Council’s renewal of its partner contribution (membership) for 2011/12. 1. That Council considers its renewal of the Surat Basin Corporation’s partner contribution (membership) for 2011/12. 2. That subject to Council’s continued membership of the Surat Basin Corporation, Council nominate Cr _________ as its representative to the Board of the Surat Basin Corporation. The Surat Basin Corporation (SBC) seeks Council’s renewal of its partnership contribution (membership) for the 2011/12 year. An invoice has been received and the cost of the renewal is $20,000 (including GST) which was the same contribution from Council in the 2010/11 year. 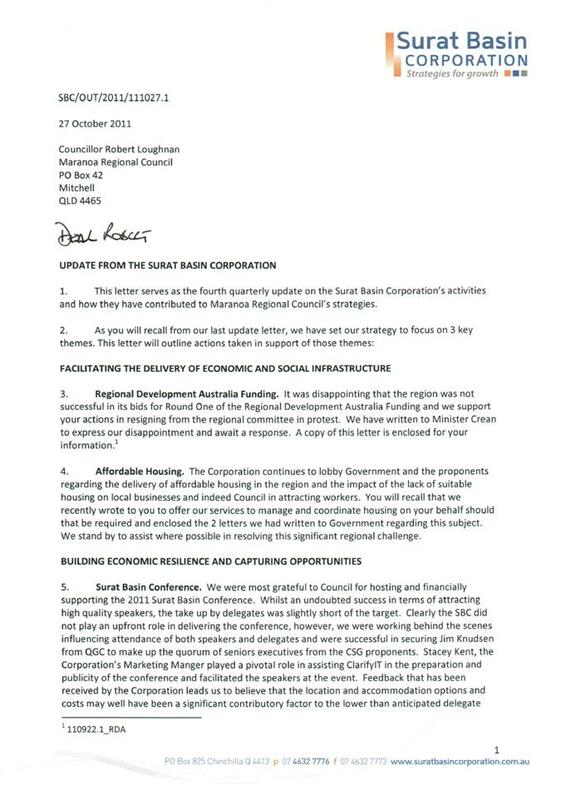 In approving its 2010/11 contribution to the Surat Basin Corporation, Council requested a review of its involvement in the organisation prior to any further financial commitment. Cr Ree Price currently represents Council on the Board of the SBC in an ex-officio capacity with voting rights. SBC represents the areas of Toowoomba Regional Council, Western Downs Regional Council and Maranoa Regional Council. 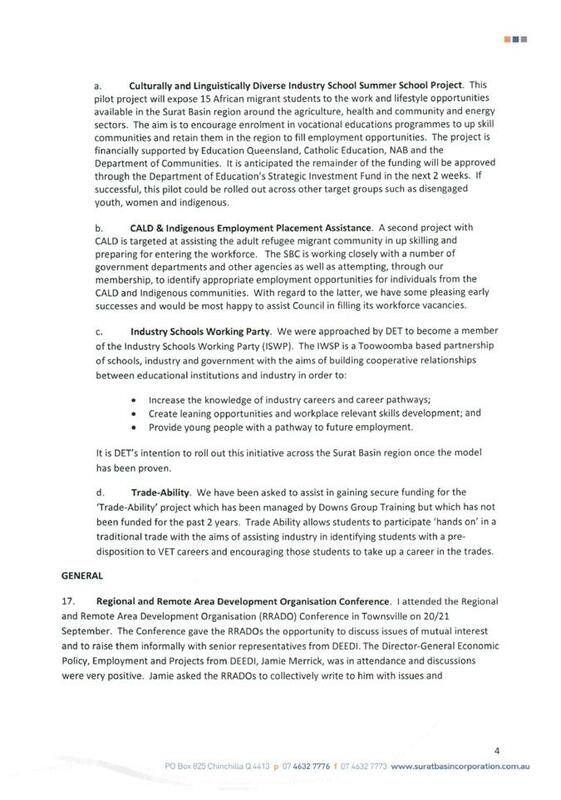 Western Downs Regional Council (WDRC) and MRC contributed financially ($20,000 each) to the SBC in 2010/11 with Toowoomba Regional Council opting not to do so. Western Downs Regional Council has budgeted to renew its partnership agreement with SBC in 2011/12 and is expected to do so. Toowoomba Regional Council (TRC) has recently facilitated the establishment of Toowoomba Regional Enterprise (TRE), which is seen by that Council as the primary organisation to facilitate economic development in the TRC area. TRC’s financial commitment to TRE is $450,000 per year for three years. 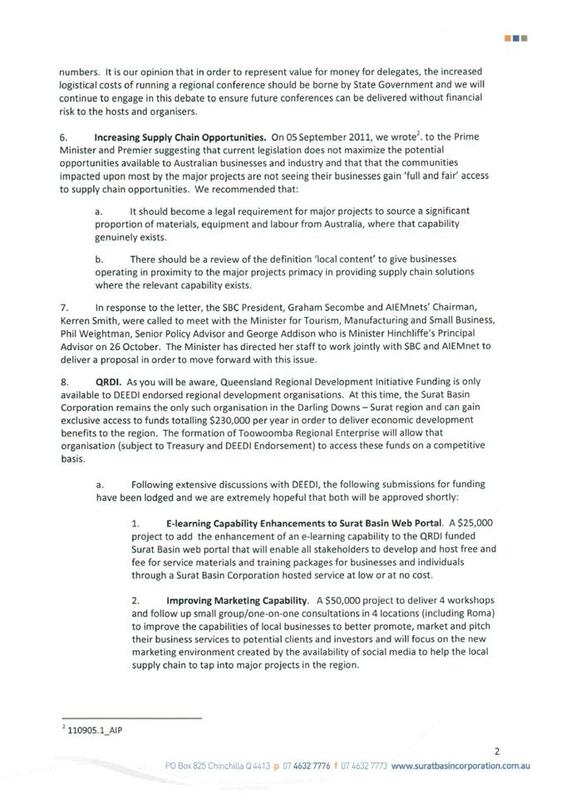 In addition, it is TRE’s intention to be acknowledged by the Department of Employment, Economic Development and Innovation (DEEDI) as a Regional Development Organisation which allows it to compete for the Queensland Regional Development Initiative (QRDI) funding of $230,000 per year. TRE will be competing with SBC for these funds. Although it is expected that TRC will continue to have some involvement in SBC, it is not anticipated that TRC will financially contribute to the organisation in 2011/12 to the extent MRC and WDRC have done so in 2010/11. DASBAC represents the areas of Toowoomba Regional Council, Goondiwindi Regional Council, Southern Downs Regional Council, Western Downs Regional Council and Maranoa Regional Council. The organisation has been operating since March 2010. Membership to DASBAC requires no financial commitment from Council at this stage. Political – as determined by Council in relation to regional cooperation if the membership renewal is not approved. $18,181 (plus GST) allocated in Council’s 2011/12 Budget. The Surat Basin Corporation is an incorporated not-for-profit regional economic development organisation. Funding for the Corporations activities are drawn from member subscriptions, partner Regional Council contribution and for specific projects, from State and Federal government grants. · Building Economic Resilience and Capturing Opportunities. · Meeting the workforce challenge. These themes will contribute to reaching our strategic goal of Regional Prosperity through Sustainable Economic Development. · Aspire to be the lead organisation for coordinating and managing affordable housing across the regional on behalf of Maranoa and Western Downs Regional Councils. · Encouraging members to enter use traineeships and apprenticeships to mitigate future workforce shortages. The water reservoirs in Roma, Mitchell, Injune and Surat are the highest points within the towns and telecommunication providers, television and radio stations, emergency services and other users are licensed with the Australian Communications and Media Authority to transmit from the towers. Council has formal licences to transmit from the Roma reservoir with the Vodafone Network Pty Ltd (Vodafone) and Optus Mobile Pty Limited (Optus) which are due to expire in May 2012. Roma Cabs have also recently submitted an application to place an antenna on the Roma tower. Council is charging minimal or no fees for service providers to transmit from the towers. It is recommended that Council implement a new fee schedule to recoup costs in providing access to the towers and contribute to the necessary upgrade of safety at the facilities. That Council adopt annual licensing fees and charges for transmitters located on water reservoir/tower sites with applicable fees being telecommunication providers $5,000 per annum, television $500 per annum, radio $500 per annum, transport providers $500 per annum, emergency services – free of charge. Optus, Vodaphone, Imparja, SBS television, Radio 4GG Gold Coast and Council all have licences from the Australian Communications and Media Authority to transmit from the Roma Water Tower. Roma Cabs have also indicated their interest in placing an antenna on the tower. The Department of Community Safety (Queensland Ambulance), Radio 4GG Gold Coast and Bundaberg Broadcasters have licences to transmit from the Mitchell Water Tower. Bundaberg Broadcasters also have a licence to transmit from the Surat Water Tower. The practice of co-location whereby a number of different telecommunications facilities, often owned by different carriers, are sited in the one location is encouraged as an efficient way to increase service levels and competition while limiting the profusion of new towers and other infrastructure. Council currently charges Optus and Vodaphone $50 per annum to transmit from the Roma Water Tower on the corner of Bowen and Whip Streets Roma. This fee is significantly less than standard market rates. Other service providers are not charged a fee. Optus paid an initial fee of $25,000 to Roma Town Council and 4GG Gold Coast (previously known as Heartland FM) have advised that they paid an initial fee of $5,000 to Roma Town Council. 4GG Gold Coast have also advised that advertising revenue received from this region is minimal and any significant increase in annual fees could jeopardise the future of their service in this region. 4GG Gold Coast currently pay $150 per annum. The Mitchell and Injune Water Towers need significant safety improvements to allow safe use of the towers by staff and contractors. Licence fees will contribute to the cost of these necessary upgrades. This resolution will set standard fees for all service providers using the Council water towers to transmit signals including telecommunication providers, radio, television, transport operators and emergency services. Optus and Vodaphone currently pay to Council a licence fee of $50.00 per annum upon receipt of a tax invoice from Council. 1 February 1999. This agreement allowed Optus Mobile Pty Limited to install a mobile telecommunication facility on the Roma Water Tower and access the facility as required. Optus has advised Council that it plans to install and maintain additional equipment on the water tower and has requested Council’s agreement to this work, through a variation of the existing access licence agreement. That Council agree to the variation of the access licence agreement between Council and Optus Mobile Pty Limited to allow for a planned upgrade of telecommunication equipment on the Roma Water Tower subject to Optus securing the necessary building approval and furthermore that Council staff commence negotiations with Optus in regard to securing a new access agreement to replace the existing agreement that is due to expire in May 2012. Council and Optus Mobile Pty Ltd have an existing Access Licence Agreement which permits Optus to access the Roma Water Tower for the purpose of installing receiving and transmission equipment for the reception and transmission of radio signals required in the course of providing mobile telecommunications. Optus is planning a network rearrangement and under the terms of their Access Licence Agreement, Optus is required to seek a variation of the agreement. Construction drawings showing the planned works is attached for Councillors information. Council’s Building Services Unit has advised that Optus will need to secure a building approval for the proposed works. This variation of agreement only allows Optus to undertake the proposed works, it does not extend the existing agreement between Council and Optus that is due to expire in May 2012. Providing access to Council’s Water Towers for transmission purposes has inherent risks associated in regard to allowing access to the towers and licensee’s contractors and employees working at heights. Such risks can be addressed through the Access Licence Agreement. The existing Access Licence Agreement is due to expire in May 2012 and Council and Optus Mobile Pty Ltd will need to negotiate a new agreement prior to this date. This will provide Council with an opportunity to review which parties it allows to use its water towers for transmission purposes and associated fees charged. Clause 5 of the original Access Licence Agreement provided for a once off payment in 1999 to Council of $25,000 and payment of an annual licence fee of $50.00 subject to the receipt of an invoice from Council. This report recommends to Council that new Delegation Limits be set and that they be allocated to staff in the approved format of the Financial Delegation Register. That Council approve the new financial delegation limits and the Financial Delegations as incorporated in the Financial Delegation Register. Due to the implementation of Authority Council is limited to six different purchasing limits. Officers have been allocated a delegation limit similar to their previous limit but in some instances officers have had to be allocated a completely different limit to that which was recorded on the previous register. The new limits are considered appropriate for all the officers positions currently held and managerial responsibilities allocated. The new system of limits has been in place since the implementation of Authority on the 6th April, 2011. The system works well for electronic requisitioning and ordering. The system works using the Organization Structure, the delegation limits (set out above) and the requirements/parameters for purchasing goods as set out in Council’s Purchasing Policy. The Authority Online Requisitioning and Purchasing system has worked well enough for Council to continue to work within it’s limitations and not change the system to suit Council’s processes and procedures. It is for that reason Council staff have been monitoring the use of the system and are now ready to put the new Financial Delegation Register to Council for adoption. The current waste collection contractor in Injune is moving out of the Region and is selling her business. The specification for the waste collection tender states that without Council consent the contract cannot be assigned, sub-let or subcontracted. 1. Council thanks Ms McPhee for her service to the Injune community and wishes her the best for the future. a. All conditions of the original tender are met by the new owners of the business including completion of all relevant documents. b. Council is advised in writing of the new contractor as soon as it is determined. c. There is no break in service delivery. Glenda Jeanette McPhee was awarded tender 11/32 – Provision of a Domestic Waste Collection and Removal Service for Injune in June 2011. 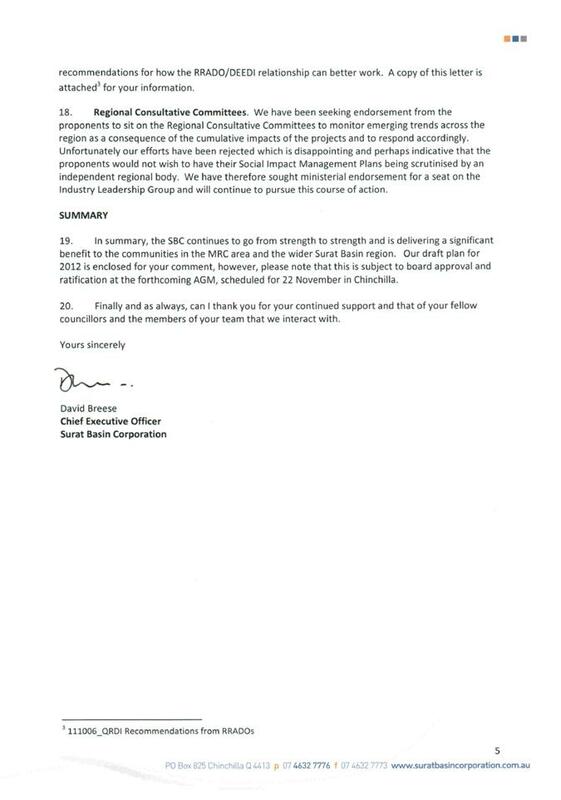 Ms McPhee has written a letter to Council (attached) indicating that she is moving out of the Region in December and wishes to sell the tender with the business. 14.1 The Contractor must not without the Council’s prior written consent (which may be granted or withheld in its absolute discretion) transfer or assign its interest under this Contract or sub-let any part of the works or services to be performed by him under the Contract, nor assign his interest in the security provided or in the monies payable or to become payable to him under the Contract. For the purpose of this clause any change in the control or share holding of the Contractor will be deemed to be an assignment of his interest. 14.2 Any assignment, sub-letting or sub-contract made by the Contractor without consent will be binding to have any effect on or be recognised by the Council and each of them will, so far as they relate to the Council be void. The provision of this service has been in Ms McPhee’s family for a significant number of years first with the Bungil Shire Council and now with the Maranoa Regional Council. I am looking to relocate to Toowoomba in December 2011 and hence seek your support to sell my contract for the Injune Domestic Waste Collection and Removal Service. I have several interested parties that are eager to purchase the business and it will be a specification of the sale of the business that the terms and conditions and as such fees pertaining to the service to council must be maintained for the duration of the contract as per the contract until the cessation of the contract in June 2014. In the meantime and prior to the sale being completed I will ensure that the service continues as per usual. I would like to take the opportunity to note that in discussions with council staff that it appears to be a significant milestone for this and such services to have been my family’s business for over 70 years working initially for the Bungil Shire Council and subsequently the Maranoa Regional Council. I would appreciate any further information you may have on what date my father Arthur Frank commenced in the role or working for the council. I appreciate your time to consider my application and appreciate your support.